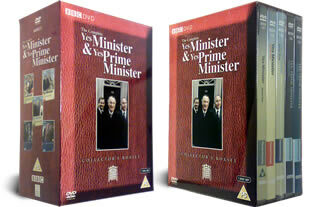 Yes Minister and Yes Prime Minister DVD box set, featuring every episode from both Yes Minister and Yes Prime Minister on 7 dvds, which ran for five and two series, respectively. DELIVERED FREE IN THE UK when you spend over £15. Stars the bewildered Rt Hon James Hacker, his crazy and scheming Permanent Secretary, Sir Humphrey Appleby and lastly, Bernard, the piggy-in-the middle, on their fraught and comical journey through the corridors of power. As usual. every thing as been ok. Thank you very much. Sound had to be turned up high to hear. Content as funny as ever. I am absolutely delighted with this box set.They don't make comedys like this anymore,get yours while they are still avalabile. I actually bought this as a gift, my sister was very happy with it. Clever, funny, satirical... what more could you ask for of a series? The acting is superb. An excellent collection. A must for every DVD library.